When the 2014-15 bowl season ended, it was celebration time at Arkansas State. Not because it had won a Sun Belt Conference title (it finished tied for fourth out of 11 teams) or because it had won a bowl game (it lost the GoDaddy Bowl to Toledo in a wild shootout). No, Red Wolves fans were just thrilled they still had a coach. Mohajir played strong safety in the late ’80s and early ’90s for what was then the Arkansas State Indians. And even then he had to deal with the fickle hearts of college coaches: The coach who recruited him, Larry Lacewell, left in 1990 to become the Tennessee Volunteers’ defensive coordinator; Mohajir then played under Al Kincaid, who was fired after two years. The future AD also served as a student assistant under Ray Perkins — who left after a single season to return to the NFL. Mohajir, though, won’t utter one unkind word about any of the short-timers. Nor does he hold any illusions about his alma mater’s place in the college football firmament, or the challenges that situation presents. But that doesn’t mean he’s going to just throw up his hands and accept mediocrity — and so far, he hasn’t needed to. Craig Mitchelldyer/Getty Images Gus Malzahn talked about sticking around for the long haul — and then left after one season. Although who the hell knows exactly where that is, now that West Virginia is a Big 12 member. So under those circumstances, it wasn’t a monumental surprise when, in December 2011, Freeze left the Red Wolves after a single 10-2 season3 to take the Ole Miss job. Fans were bummed, sure, but they’d all read (or seen) The Blind Side; they knew Freeze had been Michael Oher’s high school coach, and that he’d followed his celebrated recruit to Ole Miss as an assistant in 2005 mere weeks after Oher signed his letter of intent. “With Hugh Freeze, everybody knew from the ‘Blind Side’ movie that if Ole Miss ever opened up, he was going to go there,” says Jay Bir, sports anchor for KARK-4 in Little Rock and an Arkansas State alumnus. The Red Wolves played in the GoDaddy Bowl under an interim coach and lost 38-20 to Northern Illinois. It was still the program’s best season since moving up to the FBS level in 1992, and only the second season ever in which it’d notched double-digit wins. And any lingering disappointment vanished when the Red Wolves snagged Malzahn as their new coach just eight days after Freeze’s departure. Malzahn was already bordering on folk-hero status in Arkansas after a dominant five-year run at Springdale High School and a year as the Razorbacks’ offensive coordinator. He’d also been the brains behind Auburn’s national-title run in 2010 and had been rumored for the Vanderbilt job a year earlier, which meant the Red Wolves had scored a bit of a coup. Sure enough, Malzahn was plucked away by the Auburn Tigers after only 357 days on the job at ASU. That, Edwards and Bir say, was when the grumbling from the fan base really started. After all, Edwards points out, Malzahn had relatively deep roots in Arkansas. And he’d given every indication that those roots would keep him in Jonesboro for a while. Next up for the Red Wolves: Harsin, who’d helped mastermind Chris Petersen’s ruthlessly efficient point-scoring machine at Boise State before spending two years as the co–offensive coordinator at Texas, one of the biggest brand names in the land. For his first big hire as Arkansas State’s AD, Mohajir installed a contingency plan of sorts, including a $1.75 million buyout clause in Harsin’s contract — two and a half times Malzahn’s. And yet, when the time came, someone still ponied up. Michael Chang/Getty ImagesArkansas State has played in four consecutive bowl games, an impressive streak. That $3 million figure applies to the first two years of the deal, after which the buyout shrinks to $2 million for the third and fourth seasons and $1 million for the final year. That may be the craziest thing in all of this: Despite the turmoil of the “One and Done Era,” the Red Wolves have continued to win. A lot. 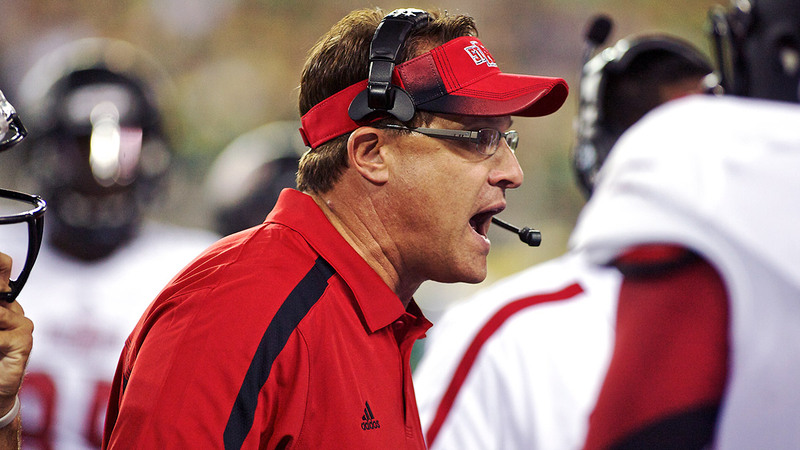 After Freeze’s Sun Belt championship campaign in 2011, Malzahn led the Red Wolves to nine wins, another conference title, and a berth in the GoDaddy.com Bowl, where, after Malzahn had left for Auburn, they registered their 10th win of the year. Harsin’s 2013 team “only” went 8-5, but that included a share of the league title and yet another bowl win. By any measure, that was ASU’s best three-year stretch since winning the equivalent of the Division II national title5 nearly a half-century ago. Before NCAA football was split into Divisions I, II, and III in 1973, programs competed in either the “University Division” (major colleges) or the “College Division” (small schools). ASU was in the latter. And the good times may not be over just yet. Though Anderson’s 2014 Red Wolves weren’t quite as dominant as they’d been in previous years — they went 7-5 in the regular season and lost their bowl game — they did stretch the program’s streaks of winning Sun Belt records, winning overall records, and bowl invites to four years. They also beat a Utah State team that finished the season with 10 wins and hung in for longer than expected in road losses to Tennessee and Miami. This year’s team stands a good chance of improving on those accomplishments. First and foremost, of course, the team will enjoy the stability of a carryover coaching staff for the first time this decade. Then there are the nine starters returning from last year’s offense, whose 36.7 points per game put them in the top 20 nationally; with mobile quarterback Fredi Knighten, who rolled up more than 4,000 total yards in his first season as the starter, back at the controls, Anderson’s up-tempo spread attack should operate like a well-oiled machine. The Red Wolves defense was thin6 and injury-ridden last season, but the coaches are banking on an influx of transfers to provide some immediate relief. Depending on whom you talk to, the lack of depth on defense might have been the first symptom of the head-coaching turmoil taking its toll on recruiting. Or maybe it was just bad luck. Either way, despite all the coaching drama, the Red Wolves continue to defy being written off as a punch line — no small feat in a state where they continue to battle a “little brother” perception. How has the program managed to maintain such a tight ship even on stormy seas? For one thing, it hasn’t let the constant threat of coach-poaching make it gun-shy about approaching hot candidates. Malzahn and Harsin, of course, were both established offensive gurus by the time ASU hired them. Anderson fits that description as well, serving as Southern Miss’s offensive coordinator during the Golden Eagles’ 12-win 2011 season, then directing an offense that smashed 35 school records when he followed head coach Larry Fedora to UNC. 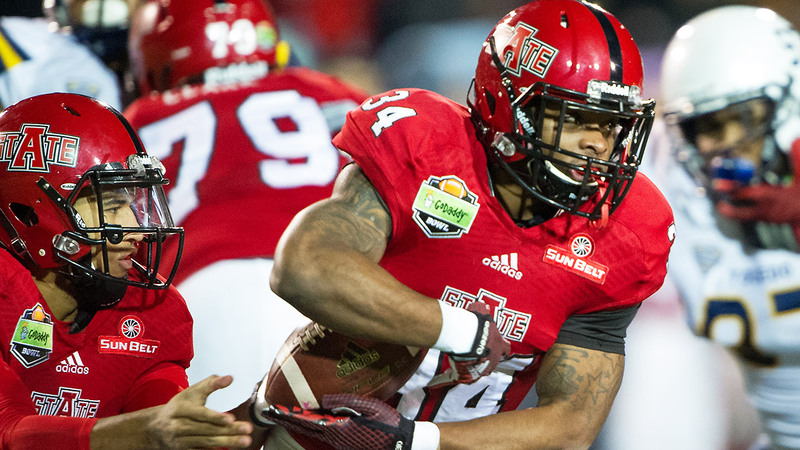 Averaging 36.7 points per game, his first Arkansas State offense broke program records, too. Just as big a key to the Red Wolves’ recent success, though, has been the resilience of the players. Mohajir has addressed the team quite a lot in recent years — out of necessity, he admits with a chuckle — and every time he has to walk them through another coaching change, his message is, “It doesn’t matter — players win championships. Coaches help you prepare, but you win championships. If you think that sounds slightly on the noncommittal side, you’re not alone.7 But Mohajir says he’s got a bigger picture in mind than one season or one coach. “In the last three years, our licensing revenues have gone up probably about 105 percent,” he says. “I think our ticket sales have gone up, our revenues have gone up, excitement, everything. Doug Gillett (@CaptainAnnoying) is a writer based in Atlanta.